SINGAPORE--(Marketwired - Nov 21, 2017) - In the news release, "Cisco and INTERPOL Collaborate to Combat Cybercrime," issued earlier today by Cisco (NASDAQ: CSCO), we are advised by the company that John N. Stewart's full title in the image caption should read "Senior Vice President and Chief Security and Trust Officer" rather than "Senior Vice President and Chief Security Officer" as originally issued. Complete corrected text follows. Cisco (NASDAQ: CSCO), the worldwide technology leader, and INTERPOL, the world's largest international police organization, have today announced an agreement to share threat intelligence as the first step in jointly fighting cybercrime. Headed by INTERPOL's global cybercrime center, the INTERPOL Global Complex for Innovation (IGCI) in Singapore, the alliance will see the two organizations develop a coordinated and focused approach to data sharing. This not only will allow for quick threat detection around the world, but also pave the way for potential future collaboration on training and knowledge sharing. Noboru Nakatani, Executive Director of IGCI, commented: "The exchange of information and expertise between the public and private sectors is vital in combating cybercrime. No country or company can do this alone. INTERPOL's agreement with Cisco provides us, and law enforcement in our 192 member countries, with access to important cyber-threat information which will help us not only detect attacks but also help prevent them." John N. Stewart, Senior Vice President and Chief Security and Trust Officer at Cisco, shared, "As cybercrime continues to escalate around the world, defenders from both the public and private sectors must meet the threat with equal force. Visibility and comprehensive threat intelligence across the cyber domain are critical to enable detection, analysis, and protection against emerging threats. We are pleased to collaborate with INTERPOL to exchange threat intelligence and find other knowledge-sharing opportunities to fight cybercrime globally." Naveen Menon, President of Cisco, Southeast Asia, said, "This agreement, signed in Singapore, demonstrates the country's growing importance in the Asia Pacific region and on the world stage as a center for battling cybercrime and driving cybersecurity innovation. We are part of a diverse region with differing levels of technological maturity. This initiative represents an important step in creating a unified strategy to reduce digital risks and enable economic growth without the fear of digital threats and attacks." Cisco's best-of-breed security offerings and its architectural approach help customers secure their organizations more effectively from the network to the endpoint to the cloud. Cisco's comprehensive security portfolio is designed to work together to see a threat once, and stop it everywhere, changing the security equation. In addition, Cisco blocks 19.7 billion threats a day through its Collective Security Intelligence, enabled by Cisco Talos, the security intelligence and research group. Cisco's agreement with INTERPOL supports the organization's programs targeting both "pure cybercrime" and cyber-enabled crimes to assist member countries with identifying cyberattacks and their perpetrators. INTERPOL is the world's largest international police organization, with 192 member countries. Our role is to enable police around the world to work together to make the world a safer place. Our high-tech infrastructure of technical and operational support helps meet the growing challenges of fighting crime in the 21st century. 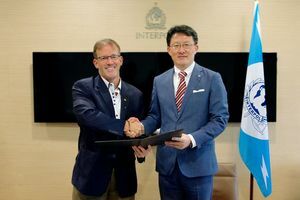 John N. Stewart, Senior Vice President and Chief Security and Trust Officer, Cisco, and Noboru Nakatani, Executive Director, INTERPOL Global Complex for Innovation (IGCI), sign collaboration agreement to combat cybercrime.